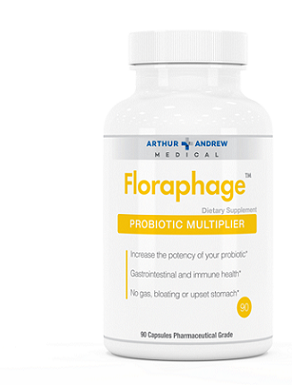 Floraphage is the worlds first prebiotic that is made from bacteriophages which are microscopic proteins that inhibit specific bacteria, which gives them very specific antibacterial properties. As the phages kill certain pathogenic bacteria in the gut, nutrients are released that act as high quality prebiotic food for our good bacteria. Lab testing has revealed that Floraphage has the ability to increase good bacteria levels 24x above control. Bacteriophages have been used in agriculture for years as a gentle non toxic way to control harmful bacteria. They have GRAS safety status with the FDA. Floraphage can be taken with Biofase, Profase or any probiotic of your choice or none at all. Manufactured in an FDA Organic Certified facility. I've been battling chronic yeast infections that do not respond to conventional treatment for about 5 years. I came across yeastinfectionadvisor.com about 6 months ago and was appreciative of the step-by-step recommendations and instructions. It did take about 2 - 3 weeks to feel significant improvement but it was nice to have a protocol to follow. I would love to say it was just the products alone that did it but I also had to follow the restricted diet and probably will have to modify my eating for the rest of my life. And, who knows, maybe with some time and healing, I won't have to be as careful as I have to be now. Too many years of eating the wrong stuff! BUT, what I liked about the products was that they did not hurt my tummy, which is a big issue for me. There's lots of foods, supplements and herbs that I have to avoid for that reason. Even after 6 weeks taking Biofase, Profase and Floraphage together at high doses on an empty stomach, my stomach and digestion were not affected. There was some die-off headaches to deal with when I started or upped my dosage (something I always run into when I'm trying to use natural treatments) but if I just went back to my previous dosing for a day or two and then upped the dose again, it was very manageable. With other supplements I've taken, I can end up in bed for days with die-off symptoms. I was maintaining well at 1 each of Biofase, Profase and Florphage each morning but I went on vacation and strayed far from how I need to eat - so my symptoms have flared up again. BUT, I'm doing the protocol again and my body has responded within 2 days instead of weeks. I'm thankful that I've found these products and the support of the yeastinfectionadvisor.com website. Copyright 2016 - 2018 D & G Industries, LLC. All Rights Reserved. Copyright D & G Industries, LLC. All Rights Reserved.